Donovan Bixley is my favourite New Zealand illustrator. He has illustrated Kiwi versions of The Wheels on the Bus and Old MacDonald, written and illustrated a book about Mozart, called Faithfully Mozart, and illustrated work by other authors, including Kyle Mewburn (the Dinosaur Rescue series) and Brian Falkner (Northwood and Maddy West and the Tongue Taker). 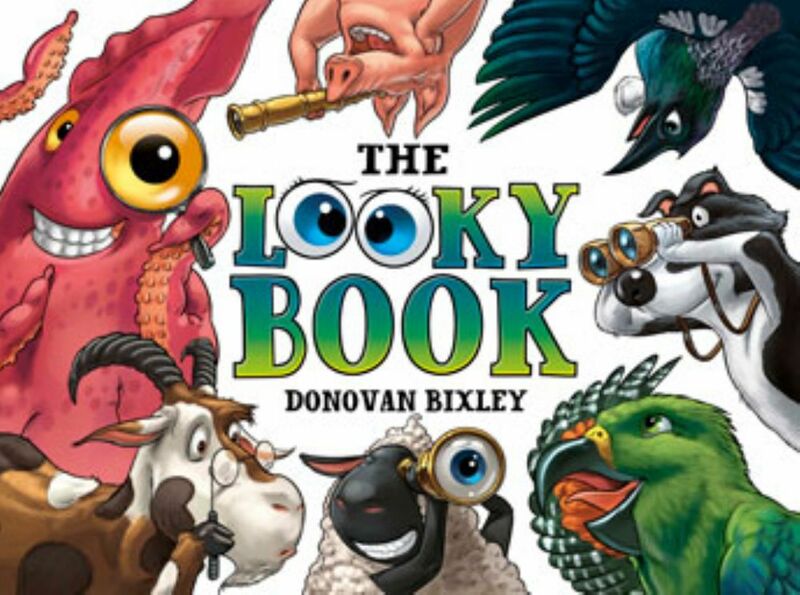 Donovan has just published his amazing Kiwi-themed puzzle book, The Looky Book (which I reviewed here on the blog). I was lucky enough to be able to ask Donovan a few questions about his illustration, his new book, and working with other authors. Your illustrations they seem to glow on the page. What materials/tools do you use to create them? Most of my work is hand drawn and digitally painted. I come from a painting background, and when I was a AUT the first computers came in. I began scanning my paintings and drawings and mucking about with them in Photoshop 1 – ha ha, you couldn’t do much. I’ve kinda just kept working on it for years and years and now that is the thing I am really highly skilled at. If I were more highly skilled at water colours or oils I would use that medium. I usually treat my digital work as a normal painting – however I’m not precious about it (I’m not here to preserve the sanctity of ‘the art’). I have a vision in my head and I’ll use any means necessary to achieve that. I once had a woman come up to me at a Storylines and ask about my illustrations. When I told her they were digital paintings she stormed off in disgust, as if the computer had done all the work – however some of my paintings, such as those from my book “Faithfully Mozart”, take 70-80 hours. Well I’m still trying to live up to my heroes, like Norman Rockwell. I am huge fan of the turn of the century illustrators like Arthur Rackham, Maxfield Parish and Edmund Dulac and also their modern equivalents, like the brilliant Russian illustrator Gennardy Spirin. A lot of my work features that kind of old-fashioned ornamentation – swirly things just seems to naturally come out. They often get cut out of the final illustrations for various reasons. There are an incredible amount of illustrators who I follow avidly, like Dave McKean, Shawn Tan or John Howe, but usually this is simple admiration rather than influence. 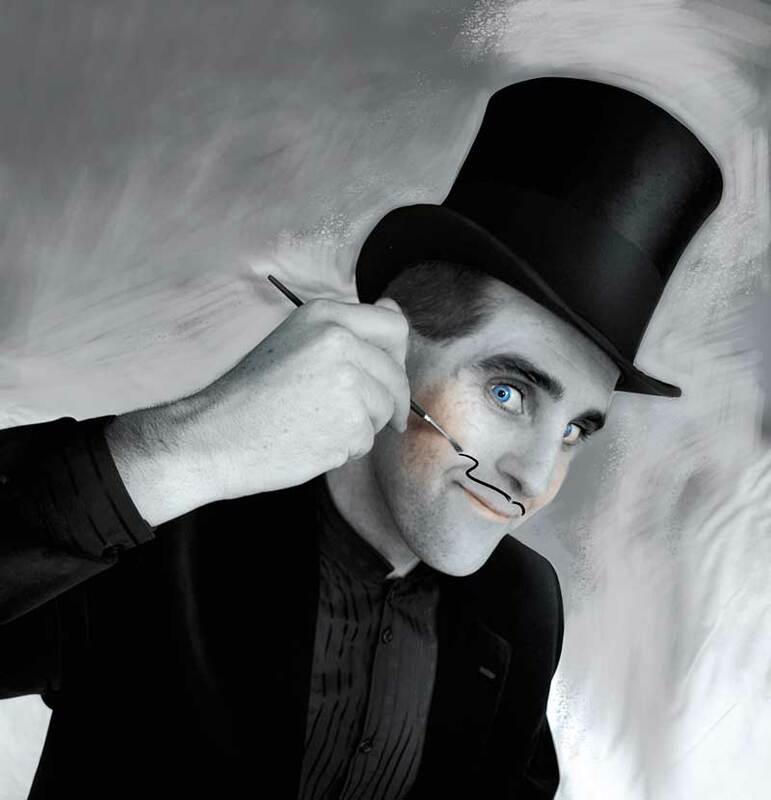 It would be pretty hard for someone of my generation not to be influenced by people like Bill Peet or Dr Suess – in fact I spend a lot of time now consciously trying to be influenced by my childhood memories, I especially like a bit of humour such as Mad Magazine or Mordillo. In that way I don’t often seek out other illustrators to inspire me. I find that I am drawing influences straight out of myself – which I suppose is where you get your own style from – all that stuff goes into you and gets all mixed up and eventually after many years you stop trying to emulate your heroes. You are just you. You’ve created Kiwi versions of The Wheels on the Bus and Old MacDonald. What do you enjoy most about putting your own Kiwi spin on these classic rhymes? I was a bit apprehensive about doing those two books actually, but what thrilled me about them both was the challenge as an illustrator. One: they’re often stories that get done so badly and I was determined that they had the potential to be really cool. Two: was the open-ness of the text. I often use “Wheels on the Bus” as a perfect illustration example when I’m doing workshops with school kids – because the words don’t constrict your imagination. All it says is “the wheels on the bus go round and round …” and the rest is up to you. So in that respect both of those books were a real pleasure to add my spin and create a whole world outside of the basic text. I loved some of the things that came out of it like ‘The All Black Lambs’ and ‘Squidly’ the colossal squid. Having said that, you’d probably guess from the variety of my other work that I really hate to be pidgeon-holed as an illustrator. I didn’t want to become ‘the guy who does kiwiana versions of old songs’. So that’s how I ended up doing “The Looky Book” – I wanted to take all those characters and situations from “Wheels on the Bus” and “Old MacDonald’s Farm” and do something different with them. So I started thinking about the type of books I loved when I was a kid. Your latest book, The Looky Book, is amazing! There is so much to find on each page. How did you decide what puzzles and scenes you would create? It was actually much more difficult that it appears. Since the book is aimed primarily at pre-schoolers, a lot of more complicated ideas had to be thrown out. Yet at the same time I always try and make my books have something to appeal to all ages. There are little things in there that the kids won’t get until they are older, maybe not until they are adults. As an illustrator, that’s an important thing for me, it keeps the illustrations alive, even after years of the reader looking at them, because they’re seeing things in a new light. It also makes the books entertaining for parents to read. Kids are little explorers and I strongly believe in giving them lots of opportunities to discover new things on each page. You’d be surprised how a kid will pick up on a tiny little aspect of a story or illustration and they’ll go off and find out all about it. If you don’t give them those opportunities then the book becomes flat and boring and will only be read a few times. As far as the puzzles that ended up in the book, I really wanted to cover a variety of entertaining visual tasks for pre-schoolers. So among the general ‘I spy’ elements are things like finding numbers, matching colours or patterns, and putting things into groups. How long did it take you to create each spread? Did you have to plan them in great detail before you started? I’m not sure how long each spread took, the whole book was a few months work spread over half a year. As I mentioned above, a lot of initial work on sketches for spreads got thrown out for being too complicated. I guess the longest would have taken a week and generally involved quite a lot of planning – more in composition, just to fit everything in. With most of my books I brainstorm a lot with my wife and three daughters, at the dinner table or in the car, coming up with ideas. So I’d have this big list of things that needed to fit somewhere in a spread and then have to figure out where that ‘where’ would be. In terms of sketch planning, I’ve stopped doing highly detailed roughs. I find that I enjoy illustrating, and get much better results, if I leave a lot of room for creativity in the final illustration. For a recent Scholastic book, “The Three Bears Sort Of” by Yvonne Morrison, I didn’t actually do any roughs at all. Instead I sent the publisher a letter telling them what I was going to do and created each page as I went. Luckily they really had faith in my ability to pull it off, and the result was a real creative explosion rather than just the technical process of turning a sketch into a finished illustration. Which spread was your favourite and which was the hardest to get perfect? My favourite is the underwater scene. It’s a homage to one of my favourite books as a kid, “Patatrac” by Jean Jacques Loup. “Patatrac” is this funny French book from the 70s without words, just crazy pictures with lots going on and no actual story. Books like that and books like Richard Scarry’s were part of the inspiration for the “The Looky Book”. As a kid I could sit for hours just looking at the pictures (actually I still do as an adult). The most difficult illustration was the forest scene, where plants and bushes make up shapes and outlines of New Zealand animals. I often have a really good idea in my head, but then making it work in the real world is a challenge. That picture took a lot of planning and was the longest to create (actually the complete opposite of how I just answered the previous question ha ha). I still worry that it didn’t work quite as well as I’d imagined it. You’ve created some wonderful illustrations for other authors’ work, including Brian Falkner (Northwood, Maddy West and the Tongue Taker) and Kyle Mewburn (the Dinosaur Rescue series). What’s the best thing about working collaboratively? I love being able to work with other authors, it means I get the best of both worlds. When there is something I really want to illustrate I create it for myself, but working with other authors allows me to create things that I never would have chosen to do on my own – it always helps if that thing fits into your areas of interest. Brian’s “Maddy West” was a real treat for me – the chance to do ninjas, break-dancing monkeys, witches, wolves and ravens and creepy old gothic houses – all these things fit right into the more serious and darker side of my work, but are far from the humourous subjects I am usually asked to illustrate. “Dinosaur Rescue” is a particular favourite. I mean, I’ve been drawing dinosaurs since I was able to pick up chalk, so it’s a dream come true to be doing it as a professional! It’s also a thrill because there’s so much room for humour and it’s a true collaboration. Kyle creates something, then I take it and add to it, then Kyle comes back and takes the something I did and adds onto that … and so on. Often the best developments are when one of us takes a little aspect, a word or a corner of an illustration, and develops a whole new branch of story from there. Best of all it’s tremendous fun which I hope is apparent to the readers. I’ve just this week begun work on a Margaret Mahy book which is a huge honour for any illustrator, and very exciting. Margaret’s work is unlike anything I’ve ever illustrated before. Often I’ll have a very obvious text that drives the illustrations, and within that I create my unique part of the story. Margaret Mahy’s works are perfect for an illustrator because (as mentioned with “Wheels on the Bus”) they don’t constrain you. I can’t quite put my finger on it, but there’s a lightness and freedom. She has an incredible way with words which is just so lovely – words for the joy of words and the sounds they make in you mouth. It’s also a lovely little story too with a nice plot and darling characters. It’s the type of work that could fall very flat or soar, depending on how you illustrate it – and I have to say I’m a little bit nervous, but I have a feeling it’s going to be very delightful. I’m also working on my next book for Hachette, which is another of my own called “The Weather Machine”. It’s a bit like those books I was talking about above, Mordillo and “Patatrac” – a book without words – which I’ve wanted to do for years. It’s about a man who makes a machine to control the weather, with Frankenstein-ish results. Thanks for joining me Donovan. I loved your answers and it’s always great to get an insight into an illustrator’s work. You can find Donovan at his website, www.donovanbixley.com and on Facebook.